Willa’s secret plan seems all too simple: take from the rich kids at Valley Prep and give to the poor ones.Yet Willa’s turn as Robin Hood at her ultra-exclusive high school is anything but. Bilking her “friends”-known to everyone as the Glitterati-without them suspecting a thing, is far from easy. Learning how to pick pockets and break into lockers is as difficult as she’d thought it’d be. Delivering care packages to the scholarship girls, who are ostracized just for being from the “wrong” side of town, is way more fun than she’d expected.The complication Willa didn’t expect, though, is Aidan Murphy, Valley Prep’s most notorious (and gorgeous) ace-degenerate. His mere existence is distracting Willa from what matters most to her-evening the social playing field between the have and have-nots. 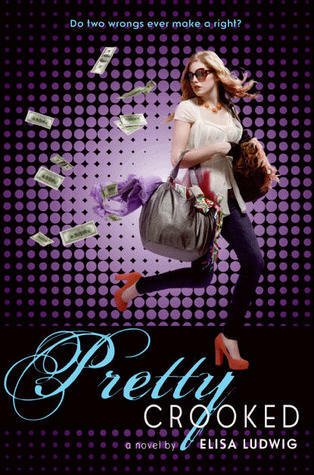 There’s no time for crushes and flirting with boys, especially conceited and obnoxious trust-funders like Aidan.But when the cops start investigating the string of burglaries at Valley Prep and the Glitterati begin to seek revenge, could he wind up being the person that Willa trusts most? The Main Character...aka.Willa. She was a pretty great character overall. She's funny, slightly sarcastic, and has a heart of...well if not gold..maybe silver. She wasn't two-dimensional. At first she loves her new friends at the Prep school and loves the popularity that being their friend creates. She actually gets to know the popular clique instead of hating them outright which makes their fall from grace that much more believable when Willa finally sees them for who they are. She also eventually ends up as someone I like and almost kind of care about. She has the whole Robin Hood vibe going on and you've gotta love a girl who will claw her way into and out of some rich-security laced house just to get some clothes to give to the poor. Still she was a tad misguided in her decisions and choices so that you kind of want to shake her around a bit, but in general you want the best for this delusional teen Robin Hood. Few...sorry about that...There are just some things that rub me the wrong way and continuing the prejudices that surround Detroit is one of them...anyways...aside from the stereotyping of a great American city...There were definitely some additional cliche moments here. For one thing the "popular rich kid" thing is so over. I am absolutely sick to death of a character being bitchy, beautiful, catty and rich. That is so boring! Why not make them poor and ugly and deceitful but nice. Or just a normal girl who gets pissed off for someone stealing boyfriends, denting a car...SOMETHING other than..."I'm rich, you're poor...we have to be enemies..." So dull. Also...the Burn Book/ Gossip Blog/ Text site that bashes all the girls in the school and spreads gossip is so 5 years ago. It was great with Gossip Girl...but now it needs to stop. I get it...there are thousands of way to be mean and spread gossip online...but I don't really want to read about it anymore. I also had a bit of an issue with the pacing and the plot itself. For the first half of the book there isn't a lot going on. There's a TON of shopping, a lot of gossiping, some school, some homework, and Willa meets people. That's about it. There is no real direction to where the story is going and when she finally starts stealing from her rich friends it almost seems like an afterthought instead of the main plot line. Also...you have no idea what is going on with Willa's mom. You know she is sneaking around with someone who may or may not be Willa's dad...but you don't find out anything else. I know this is book 1, but I want a little more backstory. Without more depth to the side plots, it seems like they are there to just fill space and add tension that couldn't be added to the main plot. I give Pretty Crooked 4 Keys. I sounded like I hated it...I know...but in all honesty it was a really fun book that had a cool premise and a nifty plot. There is a TON of potential there and I wish it would have been played with and stretched out a little more to give it the depth and great characters that could have turned it into something rivaling Ally Carter's Heist Society series...but it was just a hair too slow plotwise, and had choppy, cardboard characters that left me indifferent to how the story finished. I also hated that there were so many unanswered questions. I know that this is still book one and I should be left wanting more...but I kind of don't know enough to keep me interested you know? Still...I think I would definitely pick up the sequel if I found it somewhere...but I wouldn't pre-order it or search it out or anything. I thought this was fun even though it was a bit far fetched. I agree it wasn't mind blowing for sure but one of those books you read for a break from reality I guess. :) I really enjoyed her other book too, June of Rock. I think I might be happy that I didn't bring this one home from the library. It sounds like I would be better off to wait until the whole series is out. I do love the cover though, and it is definitely one that I will keep my eye on. It might be a great book for a crappy day when I need a quick and fun read!